I met Paul Mbugua in February, 1994. He was one of 17 Kenyans we had recruited to travel from Nairobi to New York to Tampa to compete in the 1994 Gasparilla 15k. I was already in Florida with my 2 sons (5 and 3), my wife Trudy, my mother in law, and 3 friends who traveled with us from New York when they arrived. When we got to the airport for their arrival, we walked into 17 startled, bewildered and confused Kenyans. They had just traveled from Nairobi to London to New York to Tampa. While in London, they had an 8 hour layover, with no money for food. They didn’t eat until they got to New York when one of the members of our staff met them at JFK. He flew with them to Tampa, and this was the beginning of a new and interesting chapter in all our lives. I met Joseph Nzau in Boulder, Co. in 1993 at the Boulder Boulder 10k. He and I hit it off, and decided on the creation of an American training program for young and talented Kenyans. Joseph went home at the end of the 1993 season, and selected talented runners who were ready to travel to the U.S. In retrospect, he did pretty good. Kagwe, the 2 time New York City Marathon winner. He chose Josphat Machuka, winner of the Carlsbad 5000 and Boulder Boulder 10k. And he chose Paul Mbugua. We created the name Team Stick after The Stick, which was a newer product I had just been introduced to. The Stick was my salvation to get back to running after many years of injuries to my calves, and my goal was to find a way to introduce this great product to more runners. We travelled the country, participating in many races during the next few years, and meeting many people along the way. We even set a few world records. Can you imagine? As I got to know the runners better, their individual stories were incredible. There was Philip Langat, who kept lions away from his cattle with a spear. There was Abraham Limo, who had 6 kids, and lived on $100. per month. And there was Paul Mbugua, who had 4 kids and a wife back home. Paul was different than the rest of the runners. Not only was he a great runner, (13:45 in the 5k) but he also had a master plan for his kids and wife. Paul never went back to Kenya like all the others did. He stayed, and began working 3 jobs to provide for himself and his plan. 6 years ago, Paul was able to get his 4 kids into our country. It was a momentous occasion, and the beginning of his new life with his family again. They ranged from 11to 18 years old. The joy Paul experienced could be felt and heard everytime you spoke with him. They endured the difficult cultural shift with our school system. Paul became the ultimate father and parent by providing for their every need. The kids quickly became adjusted to the new life in America. Quickly they made it through high school and were off to college. And, at every step, they excelled. 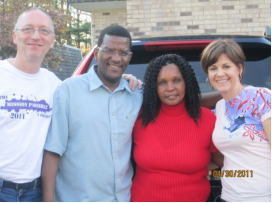 Then, about a year ago, I got the call from Paul that his wife had an opportunity to leave Kenya and join the family in the United States, six years after her children left. I was shocked at Paul’s announcement, asking him, “How would she adjust?, do you think you guys would still get along after 17 years apart?, and how will the kids handle you and Mary getting back together again?”. On a more comedic level, I asked Paul if he thought she’d take him, even after gaining all that American cooking weight. Paul, the ever-so-wise person, simply told me, “we will all do well when Mary arrives”. Low and behold, Mary did arrive about 3 months ago, reuniting this family after so many years of being apart. They’d put many American family’s to shame by showing so much love, loyalty and devotion after so many years apart. As I reflect on the many experiences my family enjoyed during the Team Stick years, the world records, the laughter, the cultural experiences, etc., I don’t think there is any greater joy than the thought that Joseph Nzau and I, in our craziest of dreams back in 1993, changed the lives of the Paul Mbugua family forever. And, with the success that this family has shown to date, the U.S. will be a better place because of it. I never could have imagined that the greatest feat of any of our runners would be Paul’s undying desire to reunite his family. I’m proud to have been a small part of this miracle. Have a great month.